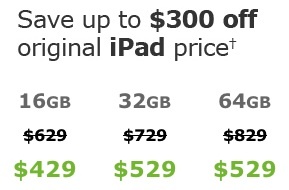 As noted by The Loop, AT&T has once again slashed pricing on the 3G-capable models of the first-generation iPad, knocking another $100 of the 16 GB and 32 GB models and $200 off of the 64 GB model. On top of the original $100 discount that went into effect when the iPad 2 was announced, pricing is now set at $429 for the 16 GB 3G model and curiously at $529 for either the 32 GB or 64 GB model. Despite the advertisement, the 32 GB model is currently showing as out of stock on AT&T's website, although it seems obvious that any customers at this point would opt for the 64 GB model at the same price point anyway. The clearance pricing comes with the caveat that no returns or exchanges are permitted, but any purchases would of course be fully covered by Apple's warranty and Genius Bar support. 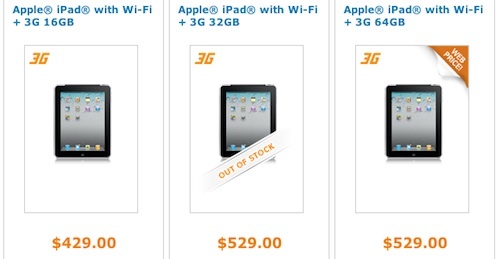 Apple's own clearance pricing for first-generation iPad 3G pricing remains at $529/$629/$729 with the original $100 discount.